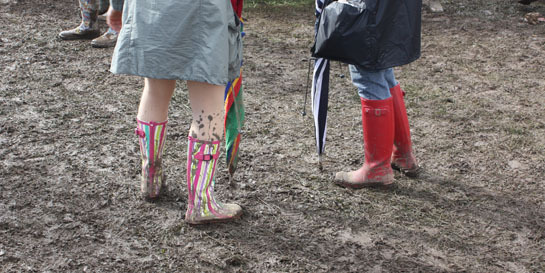 Friday at Reading Festival 2011 began with heavy rain but spirits couldn't be dampened by the weather. Bands across Universal's labels had made the trip to the muddy site to perform for over 85,000 fans. Polydor's Cherri Bomb took to the stage as the first act for the weekend and played a great set. ...but Pulled Apart By Horses still managed to attract a huge crowd. Olivia shows how wet it was, even inside the tent. Cherri Bomb came to the guest area and kindly had a photo with Olivia and Steph who both work with the band. ...and one lucky fan left with a souvenir. Fiction's Naked and Famous played to another packed tent. ...and to the top of the sound tower. Mercury's Patrick Wolf took to the stage with a multitude of musicians and instruments. ...and they pulled an enormous crowd. Deftones' lead singer pays a visit to some of the crowd. Younger fans were enjoying some of the wide selection of food on sale. Mercury's Noah and The Whale played to a rousing crowd who knew all of the words. This pair had been collecting cups all day to trade in for drinks at the bar. 40 cups = one pint. Nero and Devlin both played to huge crowds at the dance stage. It was so busy we couldn't get anywhere near the stage. Fiction's first band of the weekend, White Lies, filled the NME/Radio 1 tent. A little snack for the journey home. The rain coat is hanging at the front door and the camera is charging in preparation for Saturday. See you tomorrow Reading!